Who is it for? 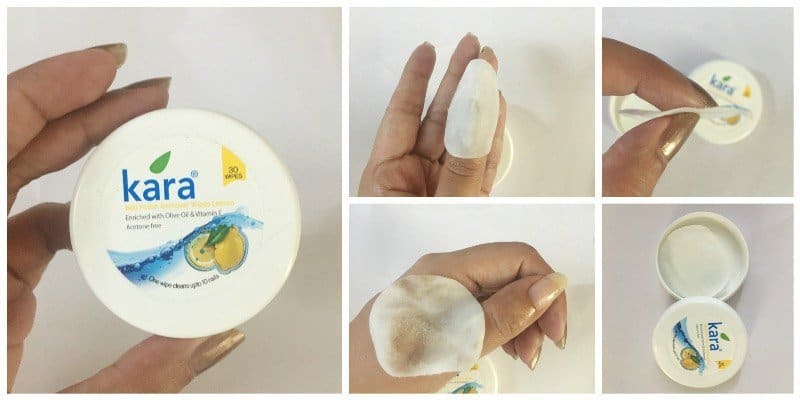 Kara Nail Polish Remover Wipes Lemon are tissue wipes pre-soaked in nail polish remover and are enriched with Olive oil and Vitamin E. They are hassle-free and travel-friendly. Take a single wipe and rub it gently over the nail to remove nail polish. A single wipe can be used for 10 nails. Close the container after taking out the wipe to avoid drying the remaining wipes. The wipes come in a white, round plastic case. The cap screws open but there is no leakage of any kind. The case is small and compact. Kara Nail Polish Remover Wipes in Lemon has a citrusy fragrance. I bought these wipes because they are enriched with Olive Oil and Vitamin E, and are acetone free. I felt that it would be nourishing for the nails but that is not the case. The wipes are pretty effective in removing the polish off the nails and one a single wipe easily cleans minimum 10 nails. The oil in the wipes make the fingers really oily and one has to wash hands to get rid of the oil. The oil does not do anything for the nails and I felt that they look dehydrated and feel rough after washing hands, even though the wipes smear oil all over them. They are travel-friendly and convenient for sure but the purpose of oil in them is a fail. Work well in removing nail paint. Makes the fingers too oily. The oil does not nourish the skin at all. The nails feel dry after washing hands. Well yes, because they are definitely convenient for traveling. But I would like to try similar products on the market as well. More Nail Polish Remover Wipes? Yes, convenience is the only major plus here!! I love nail remover liquids because they are cheap and effective. This one has oil in it to prevent dryness.. That’s a new thing..